Chiari malformation as a clinical entity has been described more than hundred years ago. The concepts regarding pathogenesis, clinical features and management options have not yet conclusively evolved. Considering that a variety of treatment methods are being adopted to treat Chiari malformation is suggestive of the fact that confusion still reigns supreme in the minds of treating clinicians. Over the years, the understanding of Chiari malformation has changed from a disease process to a natural protective phenomenon and the treatment from decompression to fixation. Aim: An alternative form of surgical treatment of prolapsed cervical intervertebral disc in patients presenting with symptoms related to myelopathy is discussed. The treatment involved fixation of the affected spinal segments and aimed at arthrodesis. No direct manipulation or handling of the disc was done. 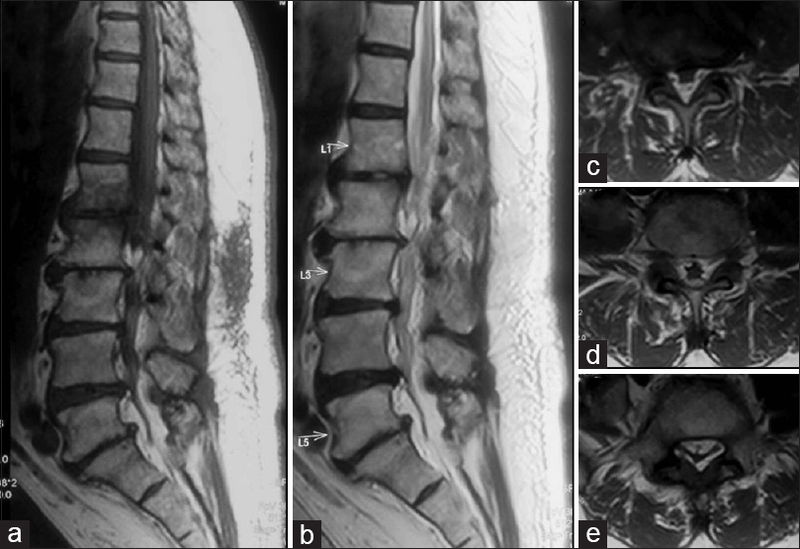 Materials and Methods: During the period August 2010 to June 2017, 16 patients presenting with symptoms attributed to myelopathy and diagnosed to have prolapsed cervical intervertebral disc were surgically treated by spinal stabilization. There were 11 males and 5 females and their ages ranged from 20 to 66 years (average: 40.6 years). Apart from clinical and radiological indicators, the number of spinal segments that were stabilized depended on direct observation of facetal morphology, alignment, and stability. Surgery involved distraction-fixation of facets using Goel facet spacer (8 patients), transarticular facetal fixation (5 patients) using screws or a combination of both facetal spacer, and transarticular screws (3 patients). Results: All patients had “remarkable” clinical improvement in the immediate postoperative period as assessed by visual analog scale, Goel's clinical grading, and Japanese Orthopedic Association scores. Follow-up ranged from 3 to 84 months (average: 50 months). The herniated disc regressed or disappeared at follow-up radiological assessment that ranged from 24 h to 3 months after surgery. Conclusions: Spinal segmental fixation aiming at arthrodesis with or without distraction of facets and without any direct surgical manipulation in the disc space or removal of the prolapsed portion of the disc can be considered in the armamentarium of the surgeon. Background: Management of combination fractures of the atlas and axis varies from nonoperative immobilization to selective early surgical intervention. In this study, we present our experience in managing these injuries. Materials and Methods: Electronic databases from two level 1 trauma centers were queried to identify all patients diagnosed with C1-C2 combination fractures from 2009 to present. Patient demographics, fracture characteristics, treatment modality, complications, Frankel scores, and fusion status were collected. Patients were separated into operative and nonoperative cohorts, and comparisons were made between the two groups. Results: Forty-eight patients were included, of which 19 received operative management and 29 were treated nonoperatively. The mean age was 76.1 and 75.3 years, respectively (P = 0.877). Frankel grade distribution was similar on presentation in both groups, with most being neurologically intact. 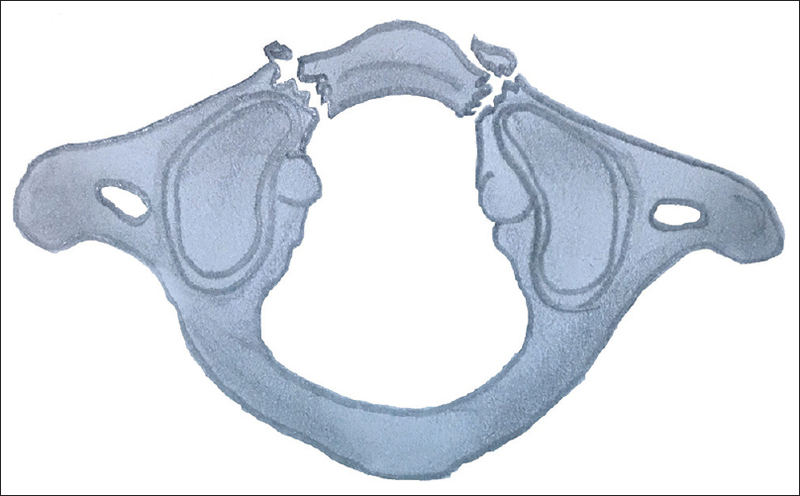 C1 fractures of both the anterior and posterior arch were present in 41.2% patients undergoing fusions compared to 27.6% of patients treated nonoperatively. No significant differences in comorbidities, neurologic deficits, or radiographic measurements were observed across the two groups. Conclusions: This study demonstrates the variety of treatment strategies used for the management of combined C1-C2 fractures. Patients managed operatively tend to have both anterior and posterior C1 arch fractures, while patients managed nonoperatively tend to have either anterior or posterior arch fractures. In general, treatments should be tailored to patients' needs depending on the stability of the fractures, neurological state, and medical comorbidities. Context: Cervical spondylotic myelopathy (CSM) is a progressive disease that can result in significant disability. Single-level stenosis can be effectively decompressed through either anterior or posterior techniques. However, multilevel pathology can be challenging, especially in the presence of significant spinal stenosis. Three-level anterior decompression and fusion are associated with higher nonunion rates and prolonged dysphagia. Posterior multilevel laminectomies with foraminotomies jeopardize the bone stock required for stable fixation with lateral mass screws (LMSs). Aims: This is the first case series of multilevel laminectomy and fusion for CSM instrumented with posterior cervical cages. Settings and Design: Three patients presented with a history of worsening neck pain, numbness in bilateral upper extremities and gait disturbance, and examination findings consistent with myeloradiculopathy. 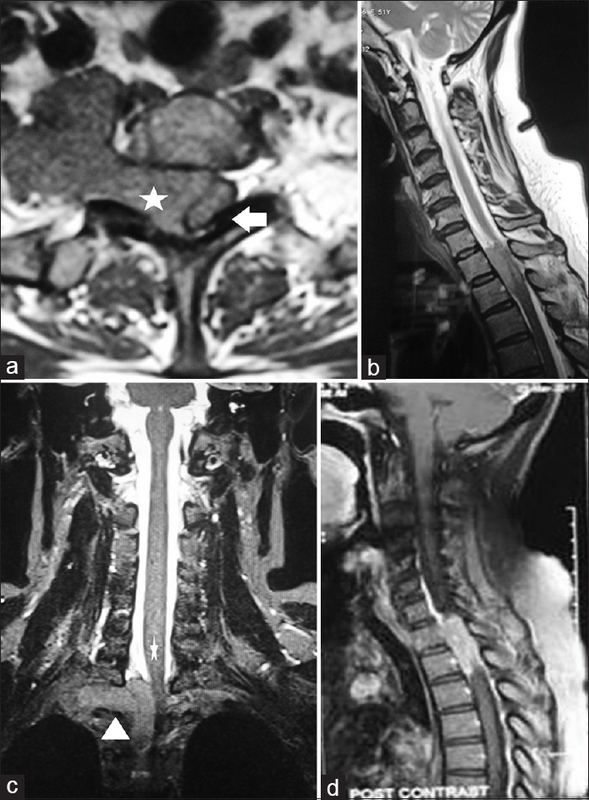 Cervical magnetic resonance imaging demonstrated multilevel spondylosis resulting in moderate to severe bilateral foraminal stenosis at three cervical levels. 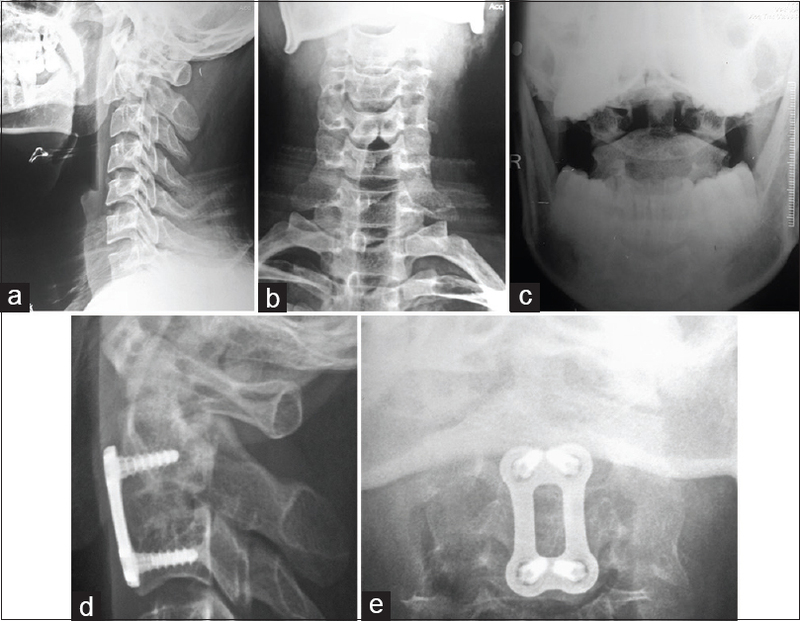 Materials and Methods: The patients underwent a multilevel posterior cervical laminectomy and instrumented fusion with intervertebral cages placed between bilateral facet joints over three levels. Oswestry disability index and visual analog scores were collected preoperatively and at each follow-up. Pre- and post-operative images were analyzed for changes in cervical alignment and presence of arthrodesis. Results: Postoperatively, all patients showed marked improvement in neurological symptoms and neck pain. They had full resolution of radicular symptoms by 6 weeks postoperatively. At 12-month follow-up, they demonstrated solid arthrodesis on X-rays and computed tomography scan. 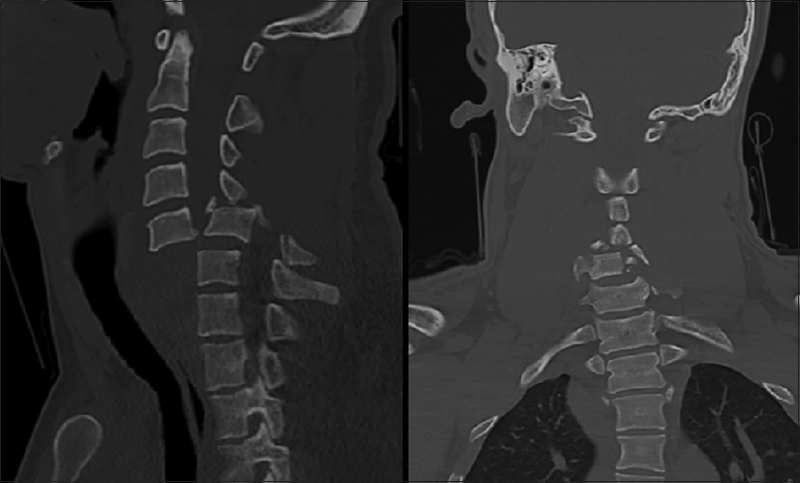 Conclusions: Posterior cervical cages may be an alternative option to LMSs in multilevel cervical laminectomy and fusion for cervical spondylotic myeloradiculopathy. Introduction: Occipital condyle fracture (OCF) is rare. It may, however, pose a serious threat to the patient due to destabilization of the craniocervical junction. Correct diagnosis and effective treatment are essential to prevent long-term complications. The aim of this study was to retrospectively investigate our current treatment program with focus on the functional outcome. Diagnosis and classification systems were evaluated for their usefulness in the clinical practice. Materials and Methods: We retrospectively reviewed all patients treated conservatively for an occipital condylar fracture from 2010 to 2015 at our department. Fracture classifications were performed according to three established systems. The patients were followed up with clinical examination and plain radiographs at weeks 2, 6, and 12 with the addition of a dynamic flexion-extension X-ray at week 14. Results: Totally 24 patients met the inclusion criteria. One was lost to follow-up and two ended treatment before completing the full treatment program due to a clinical decision. Fracture displacement was neither detected nor was any neurological deficits observed. Most patients were pain free after 6 weeks. After 14 weeks' treatment, two patients still had neck pain; the rest were pain free. Conclusions: Our data suggest that twelve weeks' conservative treatment is not necessary for unilateral OCFs without atlanto-occipital dissociation (AOD). We recommend 6 weeks of conservative treatment, with clinical control and flexion-extension radiographs before ending treatment. Plain radiography is of limited value in the clinical control of this fracture type. Anderson and Montesano and Tuli et al. classification systems fulfill an academic role. We found the classification system by Mueller et al. to be more helpful in everyday clinical practice. Background: Occipitocervical disease is common in the elderly population, and is on the rise due to an increasingly aging population. Methods: We retrospectively reviewed all patients who underwent occipitocervical fusion in our institution over a 20 year period (1996-2016) at a tertiary spinal referral centre. Patients were divided in 2 groups. Group A included all patient who underwent OCF in the first decade between 1996 and 2005. Group B was all patients who underwent OCF in the second decade between 2006 and 2016. Results: A total of 23 patients underwent occipitocervical fusion between 1996 until 2016 at our institution. Instability secondary to Rheumatoid arthritis was the leading factor in group A, responsible for 43 percent of cases. In group B, trauma was the leading burden accounting for 44 percent of the cases. In contrast to Group A however, only 19 % of OCFs occurred secondary to RA in group B. Our fusion rate was 96 percent with a survival rate of 67 percent. Conclusion: We noticed a clear epidemiological drift in the cervical spine pathologies requiring OCF during the first and second decade of study period with an increase in prevalence of pathological fractures secondary to metastatic disease. In addition, a drop in rheumatoid cervical disease requiring OCF has been noted. Background: The use of cervical interfacet spacers (CISs) to augment stability and provide solid arthrodesis at the atlantoaxial joint has not been studied in detail. The aim of this work is to report the outcomes with the use of machined allograft CISs at C1-2. Methods: A retrospective review of 19 patients who underwent an atlantoaxial fusion with the use of CISs was performed. All patients had instability documented with flexion and extension lateral radiographs. This instability was due to trauma, degenerative stenosis, symptomatic C1-2 arthropathy, and os odontoideum. Clinical and radiological outcomes were assessed. Fusion was determined based on a lack of hardware failure, absence of motion on flexion and extension plain X-ray films, and presence of bridging trabecular bone which was most often demonstrated by a computed tomography. Results: The mean age was 69.1 ± 12.9 years. Eight patients had traumatic fractures, six patients had degenerative stenosis, two patients had C2 neuralgia due to C1-2 arthropathy, two patients had C1-2 ligamentous subluxation, and one patient had an unstable os odontoideum. The occiput or subaxial spine was included in the arthrodesis in 10 patients. Rib autograft was utilized in most patients. No patient had postoperative neurological worsening, malposition of hardware, or vertebral artery injury and there were no mortalities. The fusion rate was 95%. The mean follow-up was 12.1 ± 5.5 months. Conclusions: CIS is a promising adjuvant for the treatment of atlantoaxial instability. Study Design: This was a retrospective cohort study. Objective: To report our 10-year experience of closed reduction using Crutchfield traction followed by anterior cervical discectomy and fusion within 12 h from injury for C-type subaxial cervical fractures (according to the AOSpine classification system). Methods: Clinical records and neuroimaging were retrospectively reviewed. Surgical details were provided. Results: A total of 22 patients were included in the study. The cervical fracture was diagnosed after whole-body computed tomography scan on admission in all cases. Crutchfield traction was applied within 1–5 h from the diagnosis. Surgery consisting of anterior microdiscectomy and fusion with interbody cage and plating was performed 6–12 h after traction positioning. Most patients (19, 86%) had spinal cord injury: 7 were Frankel A (31%), 3 Frankel B (14%), 6 Frankel C (27%), 3 Frankel D (14%), and 3 Frankel E (14%). No neurologic deterioration was observed after the treatment. In 10 cases (45%), neurological symptoms improved 1 year after the trauma. Two patients (10%) died for complication related to spinal cord transition or other organ damage. Conclusions: Early reduction gives the best chance of recovery for patients affected by C-type subaxial cervical fracture. Rapid traction is more often successful and safer than manipulation under anesthesia. After close reduction achieving, anterior microdiscectomy, cage, and plating implant seem to be safe and effective with a low rate of complications. Context: Posterior cervical cages have recently become available as an alternative to lateral mass fixation in patients undergoing cervical spine surgery. 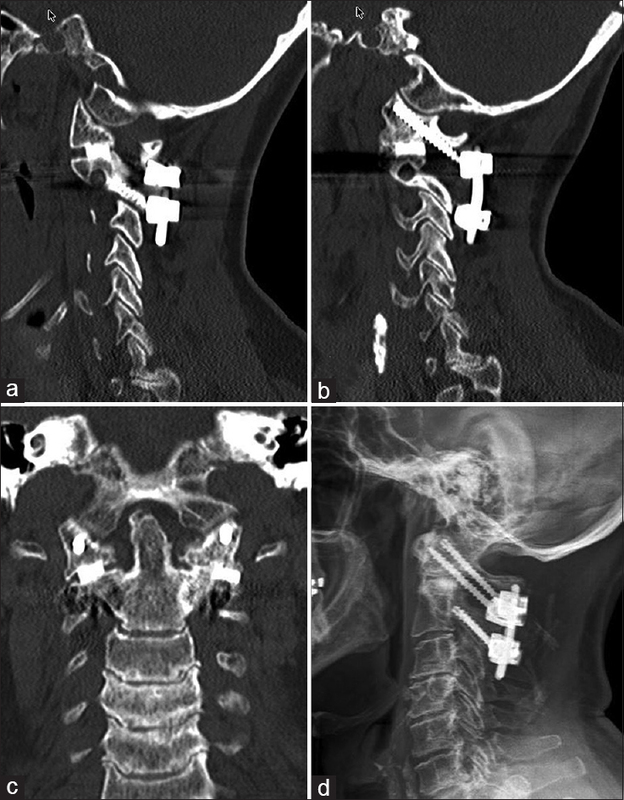 Aims: The purpose of this study was to quantify the perioperative complications associated with cervical decompression and fusion in patients treated with a posterior cervical fusion (PCF) and bilateral cages. Settings and Design: A retrospective, multicenter review of prospectively collected data was performed at 11 US centers. 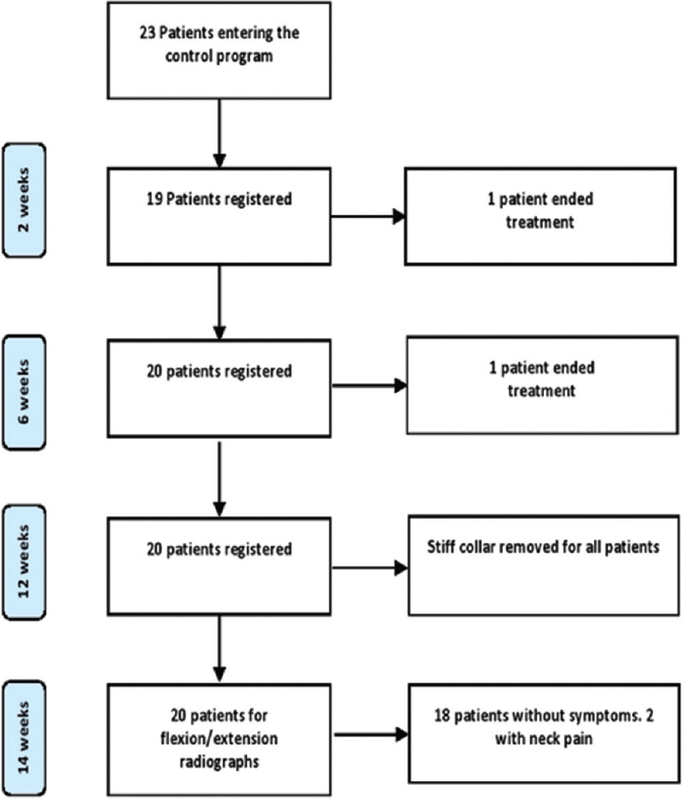 Subjects and Methods: The charts of 89 consecutive patients with cervical radiculopathy treated surgically at one level with PCF and cages were reviewed. 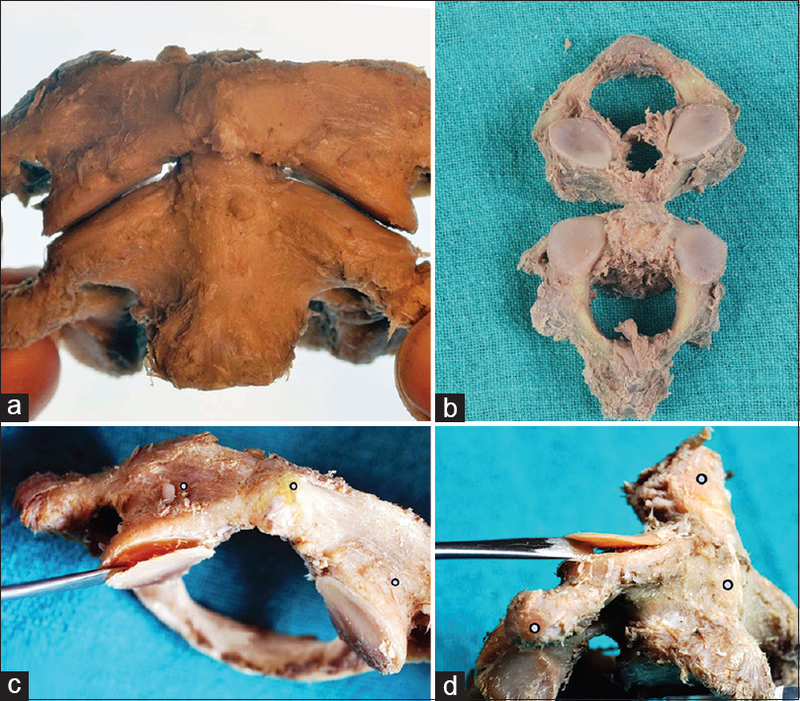 Three cohorts of patients were included standalone primary PCF with cages, circumferential surgery, and patients with postanterior cervical discectomy and fusion pseudarthrosis. Follow-up evaluation included clinical status and pain scale (visual analog scale). Statistical Analysis Used: The Wilcoxon test was used to test the differences for the data. The P level of 0.05 was considered significant. Results: The mean follow-up interval was 7 months (range: 62 weeks - 2 years). The overall postsurgery complication rate was 4.3%. There were two patients with neurological complications (C5 palsy, spinal cord irritation). Two patients had postoperative complications after discharge including one with atrial fibrillation and one with a parietal stroke. After accounting for relatedness to the PCF, the overall complication rate was 3.4%. The average (median) hospital stay for all three groups was 29 h. Conclusions: The results of our study show that PCF with cages can be considered a safe alternative for patients undergoing cervical spine surgery. The procedure has a favorable overall complication profile, short length of stay, and negligible blood loss. Aim: To study the functional outcome in unstable Hangman s fracture managed with anterior decompression and stabilization with cervical locking plate and tricortical bone graft. Materials and Methods: Between 2010 and 2016, 44 patients (range: 19-75 years) with unstable Hangman's fracture underwent anterior decompression and stabilization with cervical locking plate and tricortical bone graft in our institution. Result: According to the Levine and Edwards classification, all patients were unstable with Type IA 6 (13.6), Type IIA 35 (79.5%), Type II (0), and Type III (6.8). The mean period of follow-up was 17 months (range: 6-48 months). Neurological recovery was observed in all nine patients. All patients were relieved from axial pain. None of the patients received blood transfusion. All patients showed solid fusion with no complication related to bone graft and plate. Conclusion: The anterior C2/C3 discectomy, fusion, and stabilization with cervical locking plate and tricortical bone graft are feasible and safe method in treating HangmanÊs fracture, with the benefit of high primary stability, anatomical reduction, and direct decompression of the spinal cord. Purpose: The existing literature on lateral atlantoaxial joints is predominantly on bony facets and is unable to explain various C1-2 motions observed. Geometric morphometry of facets would help us in understanding the role of cartilages in C1-2 biomechanics/kinematics. Objective: Anthropometric measurements (bone and cartilage) of the atlantoaxial joint and to assess the role of cartilages in joint biomechanics. Materials and Methods: The authors studied 10 cadaveric atlantoaxial lateral joints with the articular cartilage in situ and after removing it, using three-dimensional laser scanner. The data were compared using geometric morphometry with emphasis on surface contours of articulating surfaces. Results: The bony inferior articular facet of atlas is concave in both sagittal and coronal plane. The bony superior articular facet of axis is convex in sagittal plane and is concave (laterally) and convex medially in the coronal plane. The bony articulating surfaces were nonconcordant. The articular cartilages of both C1 and C2 are biconvex in both planes and are thicker than the concavities of bony articulating surfaces. Conclusion: The biconvex structure of cartilage converts the surface morphology of C1-C2 bony facets from concave on concavo-convex to convex on convex. This reduces the contact point making the six degrees of freedom of motion possible and also makes the joint gyroscopic. Introduction: Kimmerle anomaly is the bony ridge between the lateral mass of atlas and its posterior arch or transverse process. This bony tunnel may include the V3 segment of the vertebral artery, vertebral vein, posterior branch of the C1 spinal nerve, and the sympathetic nerves, which results in the clinical symptoms of this disease. Reports on the surgical treatment of Kimmerle anomaly are rare. There are no reports on minimally invasive surgical treatment of this pathology. Materials and Methods: Six patients with Kimmerle anomaly were treated from 2015 until 2016. Three patients underwent routine surgery through the posterior midline (posterior midline approach [PMA] group). The other three patients underwent decompression with a paravertebral transmuscular approach (PTMA group). 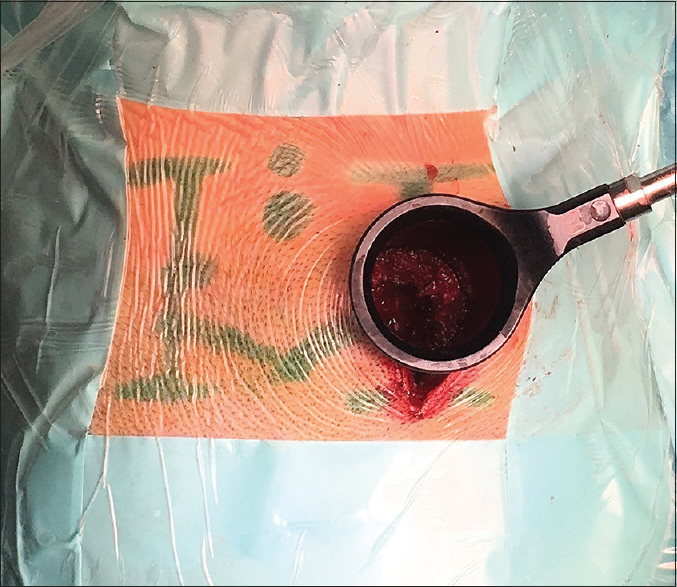 The operation time, intraoperative blood loss, clinical symptoms before and after surgery as well as intra- and post-operative complications were compared between the PTMA and PMA groups. Results: The results of the surgical treatments were assessed at discharge and 1 year later. Blood loss, operation time, and intensity of pain at the postoperative wound area were lower in the PTMA group. There were no postoperative complications. The delayed surgical treatment outcomes did not depend on the method of artery decompression. Conclusions: Surgical treatment of vertebral artery compression in patients with Kimmerle anomaly is preferable in cases where conservative treatment is inefficient. A minimally invasive PTMA is an alternative to the routine midline posterior approach, providing direct visualization of the compressed V3 segment of the vertebral artery and minimizing postoperative pain. Study Design: Atlas fractures are evaluated according to the fracture type and ligamentous injury. External immobilization may result in fracture nonunion. Objective: The ideal treatment method for non-stabilized atlas fractures is limited fixation without restricting the range of motion of the atlantoaxial and atlantooccipital joints. Summary of Background Data: Such a result can be established by using either anterior fixation or posterior lateral mass fixation. However, none of these techniques can fully address anterior 1/2 atlas fractures such as in this case. Materials and Methods: A transoral technique in which bilateral screws were placed intralaminarly and connected with wire was used to reduce and stabilize an anterior 1/2 fracture of C1. Result: Radiological studies after the surgery showed good cervical alignment, no screw or wire failure and good reduction with fusion of anterior arcus of C1. Conclusions: Internal immobilization by this screw and wire osteosynthesis technique protects the mobility of the atlanto-occipital and atlantoaxial joints. The main advantage is that neither the twisted wires inserted under the anterior lamina, nor the laterally placed screw heads interfere with midline wound closure; unlike the plate/cage and rod systems used together with anterior screws. A computer navigation system with intraoperative 3D imaging facilities will be of benefit for safe placement of the screw, however we preferred a free-hand technique, as the starting point was at the fracture line along the trajectory of the routinely accessible anterior lamina. Aim: To study the functional and radiological outcomes in cases managed conservatively for single-level traumatic thoracolumbar spine fractures without neurological deficit. Materials and Methods: In this prospective study design, thirty patients who presented to tertiary care hospital and diagnosed with posttraumatic thoracolumbar vertebral fracture without any neurodeficit were recruited. All the patients were managed conservatively as per the protocol which included bed rest, spinal braces, and physiotherapy. Adequate analgesia was given wherever necessary. The patients were followed at regular intervals up to a maximum of 2 years. 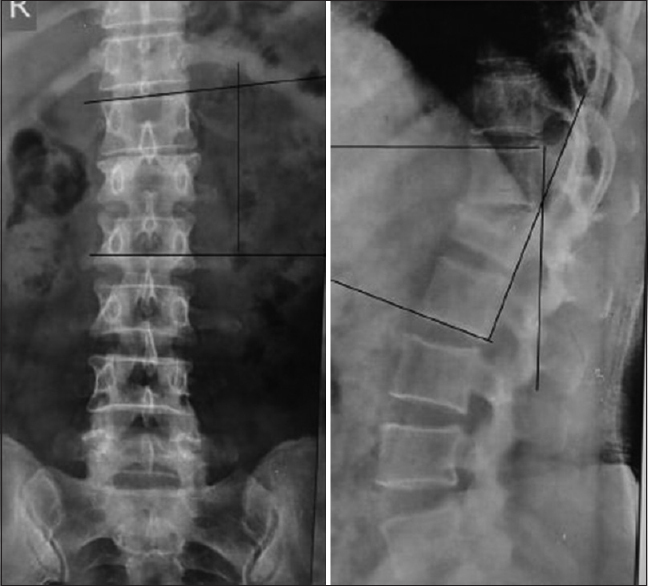 Clinically visual analog scale (VAS) score and Roland Morris Disability Questionnaire (RMDQ)-24 were assessed and radiologically local vertebral kyphosis, scoliosis, and loss of body height were noted at each follow-up. Results: The data was statistically analyzed and the results were as follows. Thoracolumbar fractures were more in young adults (<26 years) and more so among the males (80% cases). The most common fracture type in our study was compression fracture. The most common site involved in our study was L1 vertebra (36.7%). There was a significant decrease of VAS score (pain score) in 79% cases with the maximum decrease in type A1 fracture. The mean RMDQ-4 score in our study was 5.53. The overall progression of kyphosis was 1.9°. There was no relation found between the kyphotic deformity and the clinical outcomes (VAS and RMDQ-24 scores). Canal size changes were found to be insignificant at the end of 2 years compared to baseline. Conclusion: Study showed favorable outcomes in terms of return to daily activities, making it a good option in managing Type A1 dorsolumbar fractures. Though there was a progression of kyphosis but no neurological deficit was seen. Study Design: This was a retrospective analysis of prospectively collected data. Objective: The effect of C0-C1-C2 cervical ankylosis in patients with ankylosing spondylitis (AS) is not documented. 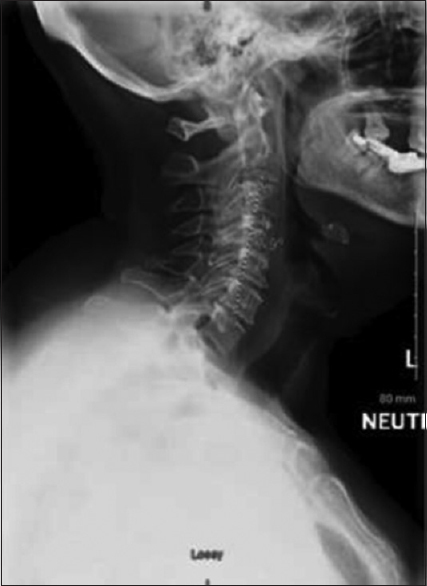 The objective of this study is to describe the radiological characteristics of the occipitocervical junction in patients with AS operated for a cervical fracture and to correlate them with their clinical evolution. Materials and Methods: Analysis of patients with ankylosing spondylitis (AS) treated in a single institution of a cervical vertebral fracture between 2007 and 2014 who were prospectively followed through the SWESPINE registry. The integrity of the C0–C1–C2 joints was determined and classified into fused and nonfused joints. By determining the angle between C0–C1 and C1–C2 joints in the coronal view of the computed tomography scan (X-angle), the progressive degeneration of these joints was described. Intra- and inter-observer reliability of this test was determined. The instruments of health-related quality of life (QOL) and disability were EQ5D and Oswestry disability index (ODI), respectively. 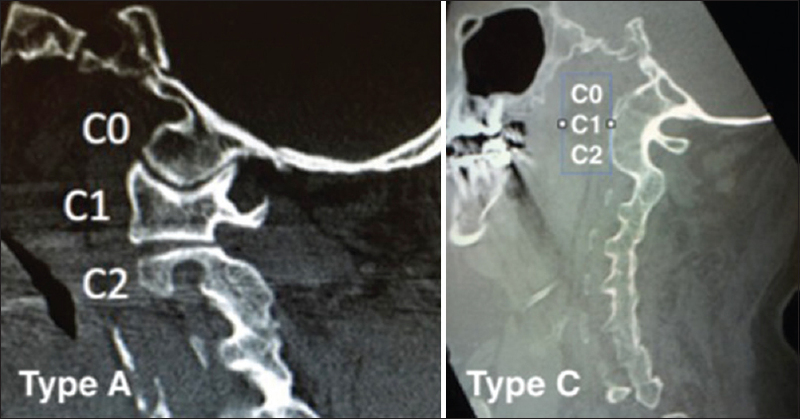 Results: A total of 86 patients with AS treated surgically for cervical fracture had complete facet ankylosis between C3 and T1 due to their pathology. Mean age 69.2 years (standard deviation [SD]: 11.7). The most common level of fracture was in C5–C6. In 24 patients, the C0–C1 joint was fused, and in 15 patients, C1–C2 joint was fused. The intra- and inter-class reliabilities for X-angle measurement were very high (intraclass correlation coefficients = 0.94; 0.92). The mean X-angle was 125° (SD: 12) in nonfused patients and 136° (SD: 14) in fused patients (P < 0.001). There were no differences in QOL and disability at 2 years between the two groups: EQ5D-index of 0.54 and 0.55 (P = 0.5), ODI of 26.4 and 24, (P = 0.35) respectively. Conclusions: X-angle is a reliable measure for joint integrity C0–C1–C2 in patients with AS. 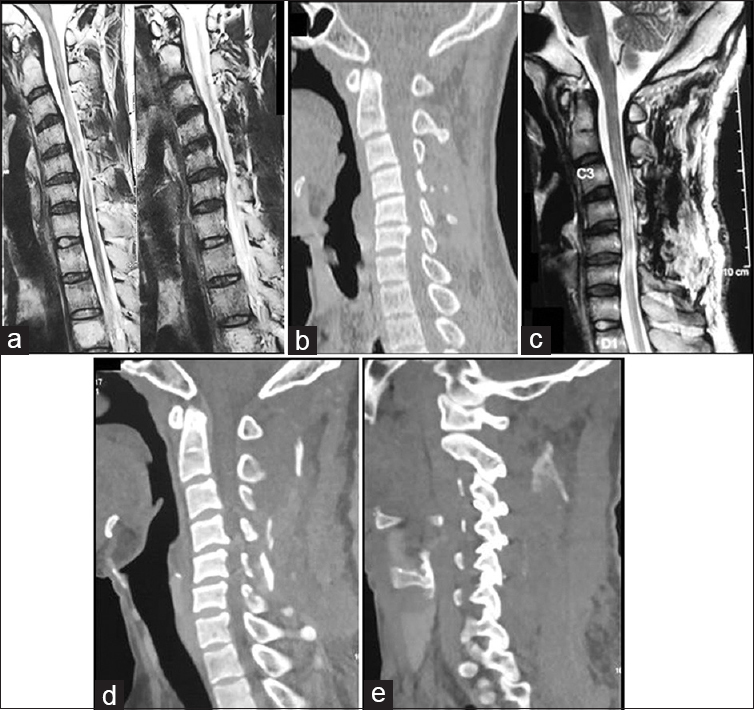 Total cervical ankylosis including the C0-C1-C2 segments is not related to poorer QOL and disability in these patients. 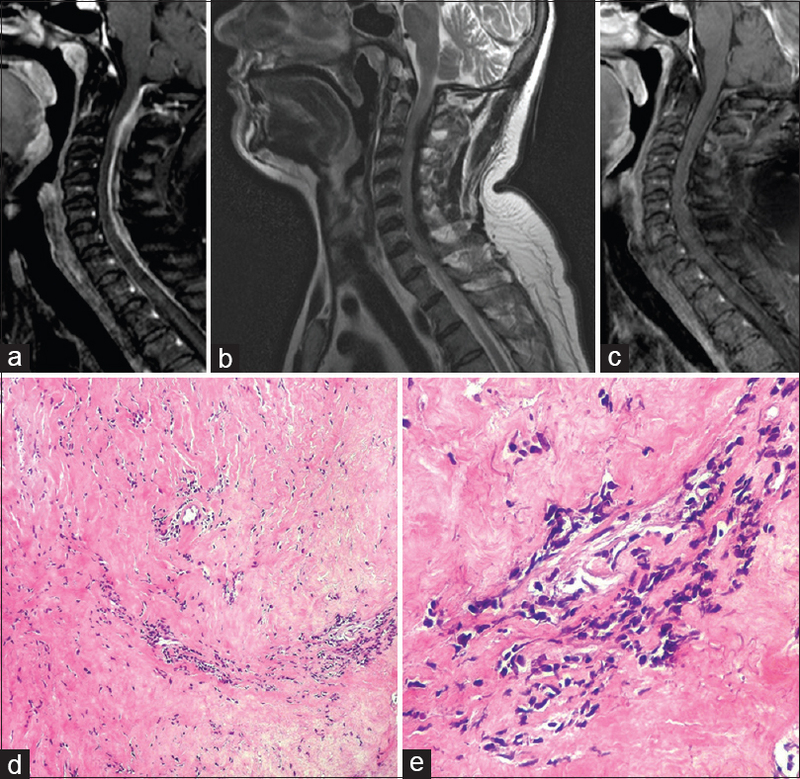 Primary spinal primitive neuroectodermal tumor (psPNET) is a rare entity with few cases reported in literature. We report a case of a 50-year-old female who presented to us with paraplegia and was diagnosed with extradural dorsal spine psPNET. The diagnosis was not suspected at presentation or on radiology but was established on histopathological examination. It is important to distinguish it from central nervous system primitive neuroectodermal tumors and from other spinal tumors since it follows a different clinical course and therapeutic outcome. Spinal Epidural lipomatosis (SEL) is an uncommon condition, usually presents in young and middle aged patients, with male preponderance. Idiopathic SEL is rare, particularly in 8th decade of life. SEL should also be considered as a differential diagnosis in approach of elderly patient presenting with lumbar canal stenosis. Such a case of 77 year old man is presented here. Low back pain in children and adolescents are usually attributed to mechanical causes and faulty positions. Although most of them are self-limiting, physicians should be aware of the red flag signs that warrant complete evaluation to rule out malignant causes of back pain. As delay in the diagnosis of vertebral lytic lesion may have sequelae in the growing children, pain disproportionate to the signs should have low threshold levels for evaluation. 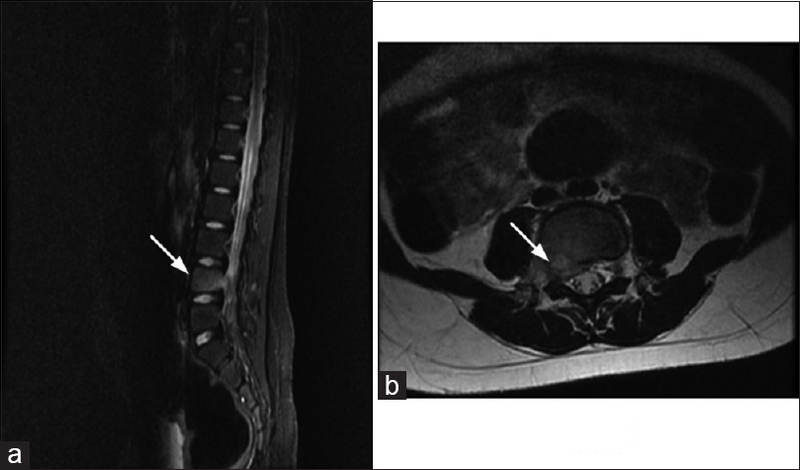 We report a case of 6-year-old boy who presented with worsening back pain. Initially evaluated for tuberculosis spine, he was diagnosed to have Langerhans cell histiocytosis of spine. He improved symptomatically with chemotherapy and spine orthosis and is in complete remission now. The spinal form of idiopathic hypertrophic pachymeningitis (IHP) is a rare condition characterized by a chronic progressive diffuse inflammatory fibrosis of the dura mater, which may evolve to the compression of the spinal cord. We present a case report about IHP focusing on its features in magnetic resonance imaging, which are determined by an intradural extramedullary mass in the cervical spine showing hypointensity on T2-weighted images and peripheral enhancement, causing compression of the spinal cord. Histological analysis showed a nonspecific chronic inflammatory process in dense fibrous tissue. The patient had a good outcome after therapy with steroids. Study Design: Technical note. Objectives: The objective of this study is to check out safety and rationality of standardized and fast tricks to select trajectory of subaxial cervical pedicle screw (SCPS) insertion, based on simple angles to bony landmarks. 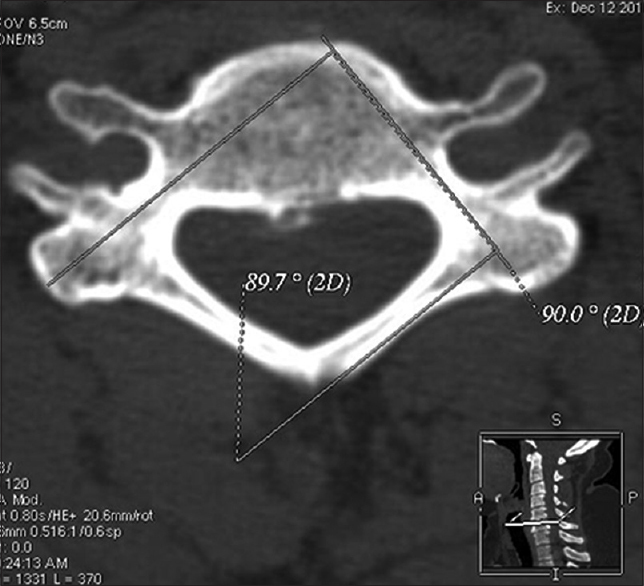 Materials and Methods: Stage 1 – Computed tomography (CT)-morphometric analysis of C3–C7 vertebrae of ten patients with cervical degenerative diseases. Stage 2 – SCPS insertion in 6 cadavers, according to the developed technique (59 pedicle screws). Stage 3 – SCPS insertion in 6 patients, according to the developed technique (32 pedicle screws). 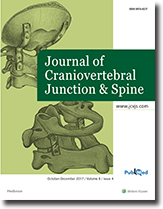 Results: CT-morphometric analysis showed that the average length of C3–C7 pedicle channels was 32 mm, the average angle between a pedicle axis and an axis of contralateral lamina - 180°, the average angle between a pedicle axis and plane of a posterior surface of a lateral mass amounted to 90° and the coordinates of an optimal entry point – 2 mm from a lateral edge and 2 mm from an upper edge of the lateral mass posterior surface. During the cadaveric study, 39 screws had a satisfactory position (66.1%), 7 screws permissible (11.9%), and 13 screws unacceptable (22%). During the clinical study, 26 screws (81.25%) had satisfactory position, 4 (12.5%) had permissible position, and 2 (6.25%) unacceptable position. Conclusion: Developed and clinically approved a method for simplicity SCPS insertion is relatively safe and cheap. No doubt, it requires further investigation, but the results of primary analysis allow us to recommend it to wide practical application.